Mysterious Waif of the Waves.. MGU? Unresolved questions regarding the April 1912 voyage of the SS Campanello and the possibility of her involvement in the Titanic disaster. Home Titanic Research Articles Mysterious Waif of the Waves.. MGU? Born at Palmer's of Jarrow on August, 29,1901 to 'parents', British Shipowners Limited. She was christened British Empire and given the official number 115224. At birth, she was 470 feet long and 56.8 feet wide; sported one funnel, four masts and was fitted with twin propellers which would give her a maximum speed of 13 knots. . Although she had room for 70 first class passengers and 2,200 third class passengers, – she spent the first 5 years of her life as a cargo ship chartered to the Phoenix line, – carrying cargo across the Atlantic from Antwerp in Belgium to New York. Her gross tonnage was 9291. However, when she reached the age of 5 years, her British 'parents' tired of her and put her up for sale. She was taken in by a family of foreign people – Italians by the name of Navigazione General Italiana. They did not like the nationalistic name with which she had been christened and so changed her name to Campania - something more to their liking. The new Italian 'parents' had great ambitions for this latest addition to their family. They were very much involved with transporting immigrants from Italy to the New World so they decided to provide her with lots of new things and to utilze her passenger-carrying ability; fitting her out with means by which she could carry immigrants. Therefore she went into one of their shipyards and was altered to enable her to carry lots of people. On March17, 1907 she commenced the first of many round trip voyages; Genoa – Naples - Palermo – New York. By this time, she was getting older and more experienced and very good at her job. So much so, that in 1910, when she was 8 years old, she was hired out to the Northwest Transport Company for 2 round trip voyage charters; Hamburg -Rotterdam – Halifax Nova Scotia – New York - Hamburg. In that same year of 1910, her Italian 'parents' tired of her and sold her on to The Canadian Northern Steamship Company which ran a service between Avonmouth, in England and the Canadian eastern seaboard. Campania's new 'parents' had just purchased the Uranium Steamship Company which was engaged in transporting immigrants from Europe to North America. Consequently, she was added to that company's existing fleet consisting of three ships; Principello, Uranium and Volturno. The intention was for her to join the other three on the North America route but to start the voyages from Rotterdam instead of Hamburg. However, there was a problem! There was another vessel with the same name– a regular visitor to New York since 1893 – the Cunard Steamship Company vessel SS Campania. Consequently, to avoid confusion, her new 'parents' re-named her Campanello. Thereafter, for the next 4 years, up until 1913; along with her sisters she plied her trade between Europe and the New World on a regular schedule carrying thousands of hopefuls from old Europe to a new life across the ocean. In October, 1913, the Volturno was consumed by a a deadly fire and sank in mid-Atlantic. The remaining three ships continued as before until 1914. In that year, at the out-break of WW1, Campanello was 'called-up' for war service by the Canadian Government and worked as a military transport for the following two years. At the end of that period, she and her two remaining step-sisters: Principello and Uranium were sold to the Cunard Steamship Company. Cunard gave Campanello a new name – Flavia. And so, for the last two years of WW1, our wandering waif, renamed Flavia, crossed the Atlanic, back and forth doing her bit for the war effort. She nearly made it! At about 5 am on the morning of 24th of August, 1918, just over 11 weeks before the 11th hour of the 11th Day of the 11th Month - the signing of the Armistice which signalled the end of that terrible war - Flavia was en route from Montreal to Avonmouth in the Bristol Channel. She was 30 miles northwest of Tory Island, off the coast of Donegal, Ireland when without warning, she was torpedoed by the german submarine U 107 commanded by Captain Kurt Siewert and sent to the bottom with the loss of a single life. She lies there to this day at a depth of 105 metres. Althought the official records show one fatality; there is an account from a survivor which suggests that in fact, 374 souls were lost that morning. The life and death of this particular 'waif' was not remarkably different from many similar vessels built before 1914 and eventually lost during the Great War of 1914-18. However, there was one particular set of circumstances which just might make her a significant player in the world's most celebrated sea disaster – the loss of the RMS 'Titanic'. During the two official inquiries into the loss of the new White Star liner, it was revealed that while Titanic was struggling for her life – while her lifeboats were being made ready and while they were being launched – a vessel was seen approaching her position from almost right ahead. This vessel remained in the vicinity for at least two hours before disappearing from sight. To those on board Titanic; the sight of the approaching stranger would surely have seemed an act of providence. However, their relief at seeing her must have turned to puzzlement, followed in quick succession by amazement, disbelief, despair and finally, anger when this potential saviour seemingly ignoring their plight – turned away from the scene and finally vanishing into the darkness. Because of highly publicised eye-witnesses accounts and press articles regarding the incident, the authorities could not ignore it. So they set about establishing an identy for the vessel in question. They didn't spend too much time over their search and settled for the most convenient candidate. ...the Leyland Liner SS Californian. The SS Californian under the command of Captain Stanley Lord, had been heading west at the time of the Titanic disaster, but an hour and a half before Titanic hit the iceberg, Californian had been stopped by an ice barrier. The distress position transmitted by Titanic was some 19.5 miles to the south-south west of where Californian was stopped. However, in their evidence, Californian's officers reported seeing rocket signals to the south-south east of their location - not to the south-south west! Despite this glaring discrepancy and other contrary evidence, the British Wreck Commissioner found: "When she first saw the rockets the "Californian" could have pushed through the ice to the open water without any serious risk and so have come to the assistance of the "Titanic." Had she done so she might have saved many if not all of the lives that were lost." By the same token, the US Inquiry reported that they were of the opinion that the SS Californian"was nearer the Titanic than the 19 miles reported by her Captain. "- that "her officers and crew saw the distress signals of the Titanic and failed to respond to them in accordance with the dictates of humanity, international usage, and the requirements of law", In their opinion: "such conduct, whether arising from indifference or gross carelessness, is most reprehensible, and places upon the commander the Californian a grave responsibility.". Captain Lord carried these outrageous accusations with him to his grave! Back to our 'Waif of the Waves'! First; on day 10 of the US Senate Inquiry: " the masts were pretty close together. She might have been a four-mast ship or might have been a three-mast ship, but she certainly was not a two mast ship." Then on Day 13 of the Wreck Commissioner's Inquiry regarding the same subject in answer to question 15401 : " I was paying most of my attention to this steamer then, and she was approaching us; and then I saw her sidelights. I saw her green light and the red. She was end-on to us. Later I saw her red light. This is all with the aid of a pair of glasses up to now. Afterwards I saw the ship's red light with my naked eye, and the two masthead lights. The only description of the ship that I could give is that she was, or I judged her to be, a four-masted steamer." It has been claimed by researchers that in fact, the relative movements in bearings between the two ships was due to Californian swinging round causing the changes in navigation light configuration. However, they ignore the fact that there was only one way in which Boxhall could dispense with the use of aids to vision and that would be when the other ship got close enough for him to use the naked eye. He clearly states that he did eventually see all of the other ship's lights with the naked eye. 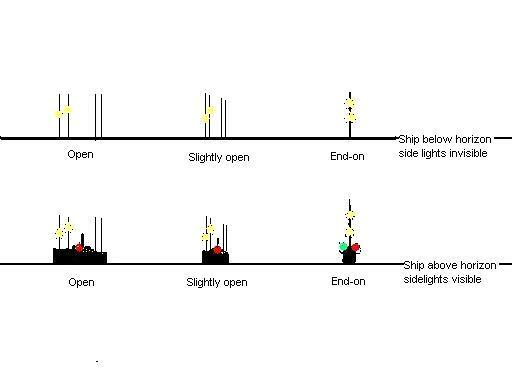 Theoretically, it was possible for red and green sidelights of a ship similar to 'Californian' or 'Campanello' to be visible from the bridge of Titanic at a maximum separation of 16 miles . However, in practical terms, This could only have been achieved by using a telescope. It is highly unlikely that such lights would be visible to the naked eye at a distance greater than 5 miles. After her arrival at Rotterdam,Campanello's Captain was reported as saying that during the period April 14/15, his ship was confronted by pack ice, field ice and bergs between 42°00'N..50°16'W and 41°10'N..49°00'W. By the wording of his report -"during the period 14/15 April"- her Captain is telling the reader that he first encountered the ice on April 14 and finally got clear of it the next day on April 15. Since he gives coordinates indicating the extent of the pack ice, his ship must have travelled along a course indicated by those coordinates during the period in question. The following sketch suggests the track followed by Campanello as described by her Captain. I have included the positions of Titanic, Carpathia and Californian for reference. 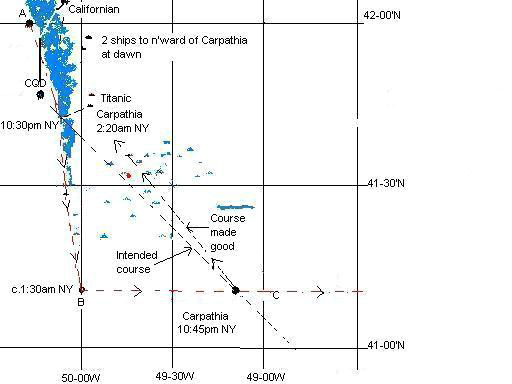 I also show the actual and intended tracks for Carpathia and the relative New York times and positions for her and the mystery vessel during the period 10:30pm April 14 and 02:20am April 15. In the above sketch, the distance from (A) in 42-00'N., 50-16'W. to position (C) in 41-10'N.,49-00'W is approximately 96 miles. Since Campanello was a 13 knot ship, she could not have covered that distance in less than 7 ½ hours. However, we do not know where and at what time along the line (A-B), Campanello first met with the ice. If she was indeed the vessel seen by Boxhall at 10:30pm New York Time and if she had come from the north and was heading down the western edge of the ice; it would mean that the latest time of arrival at point (A) would have been about 9:15pm New York time on April 14. 1912. Thre is, in fact, evidence of a vessel to the southward of Californian at that time. It was given by Californian's Third Oficer Charles Groves on Day 8 of the UK Inquiry. He told of seeing a vessel approaching Californian from the southward at about 9:20pm NYT on April 14. This vessel, unlike Titanic, had two white masthead lights! Since the distance from point (A) back to New York is 1191 nautical miles, Campanello's departure time from her berth at New York would have needed to be in the early hours of April 11th... possibly later if she picked up some of the Gulf Stream. Her scheduled time of departure from New York was indeed April 11, 1912! In the previous sketch, we also see the intended track of the Carpathia and her approximate position where she found Mr. Boxhall's boat. It might be argued that the mystery vessel; as well as having seen the distress signals from Titanic - could not have avoided seeing the signals from Carpathia nor could the men on Carpathia have missed seeing the mystery vessel. In fact, by the time Carpathia fired her first rocket, the mystery ship –Campanello or A. N. Other – would have been over 25 miles to the southwestward. In any case; all eyes on both ships would have been straining ahead, watching for ice! At this juncture, the evidence in favour of Campanello being the likely candidate is compelling. That is, until we learn her average voyage time from New York to Rotterdam would be 11 days and that she arrived at Rotterdam from New York on April 25, 1912 and that 2 days previously, at 9-30am on April 23, she was 140 miles west of Bolt Head in Devon, England. The April 23 position west of Bolt Head works in perfectly with the April 25 arrival date. However, the April 25 arrival date at Rotterdam minus the average voyage time of 11 days allows for a departure date from New York no earlier than April 14 – the day of the disaster. From New York, it would take Campanello 3 days 19 hours steaming to reach the ice barrier, meaning; if she left New York on April 14, she would not have been in the vicinity of the disaster site before late April 17. So it seems she was not the culprit after all. But then her Captain throws another 'spanner in the works'... he reported that his ship was 'a day away' from Titanic when he heard about the disaster. A day away ? Was that the next day – April 15? or a day's steaming – 308 nautical miles – away? Whatever he meant; it puts his ship firmly back in the 'ball park' because it gives a target day of April 15/16 and a new York departure of around Noon on April,11. Perhaps a closer look at the round-trip voyage of the 'Campanello during March/April, 1912 might help to clarify matters? At the time of the Titanic disaster, Campanello was on the Rotterdam, Halifax - Nova Scotia - New York - Rotterdam run. On the voyage in question, she sailed from Rotterdam on Saturday, March 23,1912 and arrived at Halifax the following week, on Wednesday, April 3 – an eleven day outward voyage! At Halifax, she disembarked passengers and some cargo before sailing for her final destination; New York. She arrived there on April 8. Her scheduled departure date from New York on the return journey to Rotterdam was April 11, 1912. She finally arrived at Rotterdam, Holland on April 25.. a fourteen day homeward voyage that would normally have taken her less than 11 days! Every North Atlantic man will tell you that the voyage westward takes longer than the same journey going east. In this case, it seems that Campanello was the exception to the rule. She either took a much longer route on the way back from New York to Rotterdam or was delayed leaving New York. Only a sighting of an official record of her time of departure from that port will clear up that matter! If her Captain chose the shortest, most direct route between New York and Rotterdam, 'Campanello' would require to steam a distance of 3,270 nautical miles. On the other hand, if he chose to follow the same return track followed by the RMS 'Olympic' and other trans-atlantic liners- the southernmost track - his ship would cover a total distance of 3,453 nautical miles. However, the fact that he reported finding ice in latitude 42 North, tells us he was well to the north of the main east-bound liner route. This favours choosing the shortest, most direct route back to Rotterdam... was he saving coal? Regardless of the route chosen, and barring lengthy breakdown - if Campanello sailed from New York on April 11; at her average speed of 13 knots, she could have been expected to arrive at Rotterdam sometime during April 22. She did not! – acording to the report, she arrived at Rotterdam 3 days later.. So what happened? Did she sail from New York on April 14 ? If so, then she was three days late in sailing. Obviously she had been at longitude 49°West at some time during her homeward voyage. Therefore, if she was, as reported,140 miles west of Bolt head at 9-30am on the morning of April,23, 1912 and had maintained her average speed after passing the ice barrier, then she was at 49°West at or near midnight on April 18, 1912 and must have sailed from New York on April 14. 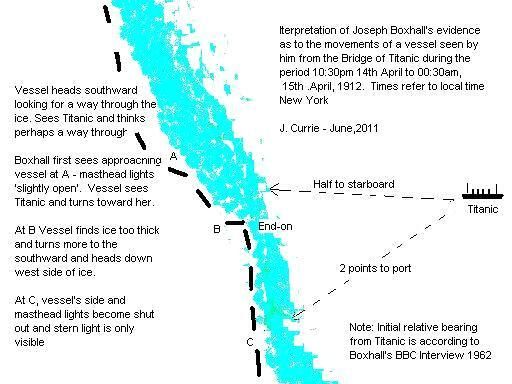 This means she negotiated the ice barrier during the evening of April 18.. not as reported; during April 14/15 and could never have been 'a day away' from Titanic when she heard of the disaster. There is a three day gap in theApril voyage of theCampanello and a great deal of contradictory information regarding her movements between April 11 and April 18, 1912. Many readers will be familiar with the passenger list and list of survivors. Among the latter are two outstanding individuals. Both gave extensive evidence at the US Senate Inquiry. These were Colonel Archibald Gracie and Mr. Lawrence Beesley. The latter was the author of a much quoted account of the maiden voyage of Titanic, her sinking and his subsequent survival. Although the spelling of one of the names differs by a single letter, I'm sure the following quote from part of Campanello's 'birth' notice in The South Shields Gazette of Saturday, 31st August, 1901 will be of interest to some. There was a launch on Thursday at the Jarrow yard of Palmer's Shipbuilding and Iron Company, Limited..... a finely modelled twin screw steamer....... The vessels have been constructed for the British Shipowners' Company, Limited (Gracie, Beasley, and Co.) of Liverpool for their Antwerp- New York trade and she is a sister ship to the British Prince and the British Princess which carries such an excellent reputation as transports, having been chartered by the Government for a considerable period to carry troops, etc., to South Africa. The christening ceremony was gracefully performed by Miss Elizabeth M. Gracie, daughter of Mr. W. Gracie, one of the managing owners of the British Shipowners' Company. Captain Jim Currie.. July, 2011. "RMS Titanic Navigation and Ice Reports" by Dr. Paul Lee. Thanks to Mr. Senan Molony for a sighting of Marconi Company Communications Chart for April,1912 and for his editing assistance . Reed's Table of Distances, 11th Edition, 1947.